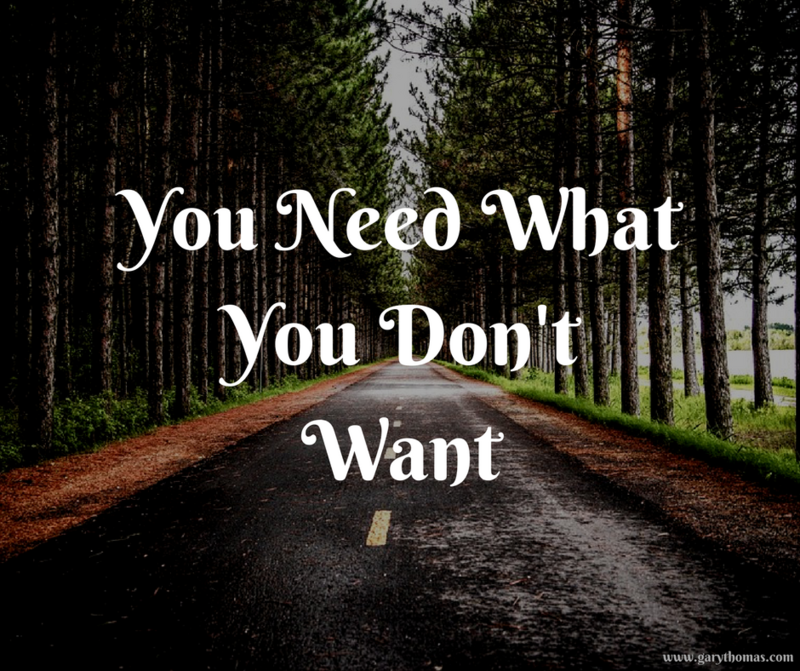 What if one of the things we need is something we don’t want? One of the things I love about marriage is that it can lead us to places where we will be all but forced to rely on God like we never have before. My friend Rett gulped deeply when the doctor told him that his wife Kristy had to have a particular operation that could keep her in bed for several days and require special care for a few weeks after that. Rett is a cognitive man, a brilliant lawyer, but he tends to live in his head with concepts and arguments and a quick wit. He makes a good living and can hire people to do what he doesn’t want to do. He’s not used to playing the role of a nurse, which is what he knew he would have to be doing for his wife. Marriage is a long journey—long enough so that eventually even the lower maintenance spouse is going to be at least temporarily high maintenance. While many might see this as a curse to bear, this actually can be seen as a gift if the normally higher maintenance spouse views such seasons as opportunities to step up and switch seats, becoming the primary caregiver, perhaps even becoming a different kind of person. Ruts are comfortable, but limiting. They stifle personal and spiritual growth. Marriage sometimes forces us out of those ruts so that we are invited to grow in areas in which we may not want to grow, but in which God is eager for us to grow. In case you’re wondering, Kristy gave Rett a glowing report about stepping up, though she admitted he was rather relieved when one of her relatives finally flew into town and took over. Here’s the key: marriage presented Rett with a situation he would never have chosen on his own. Rett didn’t choose marriage to learn how to become a nurse—part of his attraction to Kristy was the fact that she was so low maintenance—but that’s what he had to do now that he was a husband. Marriage called him to step up outside of himself, depend on Christ, and in the process become more like Christ. Rett followed and appreciated Christ the teacher, but Jesus wasn’t just a teacher. Christ touched the lepers, healed a woman who had been bleeding for years, and regularly made time out of His schedule to attend to the physical needs of those He loved. To put it in language Rett can now understand: Christ on earth wasn’t just cognitive; He was also caring. For Rett to become more like Christ, he had to grow in the same area. He’s got the cognitive down—you’re not going to trick him with false doctrine—but can he learn to care? Ask yourself, what if marriage is supposed to be difficult on occasion so that we are forced to learn to rely on God’s Holy Spirit and become a different kind of person? What if God is more concerned about our “practical atheism”—saying we believe in Him but rarely relying on Him—than He is about how easy our marriage might be at any given moment? What if half of our frustration in marriage results from the fact that we want it to be easier but God wants us to become more mature? Consider what your marriage may be calling you to today that you don’t feel capable of doing on your own. Instead of saying, “This is just too hard” or “This just isn’t my gifting or calling,” or “that’s not why I got married,” invite God to transform you into a different kind of person. Instead of running from the difficulties of marriage, let’s allow them to teach us the glory of spiritual dependence on God. Let’s accept the invitation to become a different kind of person. It may not be what we want most of our marriage, but it may, in given seasons, be what we need most from our marriage. Although single, you reming me how much how God is working in my life and drawing me daily closer to him and much I have to be thankful for in my life! When we ditch The Pride, that says WE can take care of and / or handle any situation, we can finally let go of the dispair we feel when these “ruts” come. A dependent heart is a heart free of the painstaking act of fixing or handling any siuation on our own – We are unable to do so, without The Holy Spirit that Helps and Comforts us… In Jesus name that is… Good stuff Gary! This teaching is one of those l have struggled with as l looked at some families where the husbands have to go full length to be a low maintenance and a care giver when l think the wife is suppose to do such, probably my perfectionist spirit expects too much from the women in marriages than they could offer, however, am learning from this post and its helping me prepare my mind and to also break some self built hedges that are maritaly irrelevant. Thanks Gary, God bless your ministry. Thank you for sharing your insight, Pastor Gary. Love the thought of rutts being comfortable, but limiting. When we are pulled out of our comfort zone, it’s a good time in life to choose joy~and not be shackled by circumstances of living. This can also be applied to parenting, which is where my struggles have been recently. His truths can be applied across all situations. Thank you. I believe this is one of the primary reasons most marriages fail. There comes a point when a shift occurs in the relationship for the purpose of their growth in godliness and maturity, and it’s “too hard” to bear. The thing it, they will discover this follows them into their next relationship because God is faithful! He promises to complete the work He’s begun in us. It’s best to bend a grow rather than resist and break. Excellent blog post. I really enjoy your insights. Thank you! This was an excellent teaching/ reminder!! Thank you.